This book proposes a new approach to economics, management and organization that should help in making economic organization ‘wise’, ‘innovative’ and ‘robust’ in an uncertain and risky world. 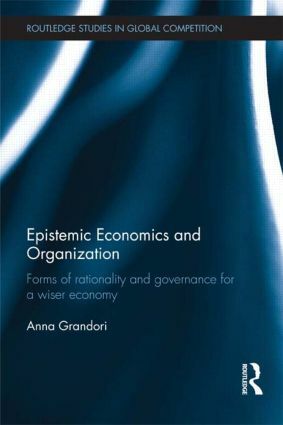 Although the modern economy and society is ‘knowledge intensive’, Anna Grandori argues that the dominant economic, organizational and behavioural models neglect to a large extent the problem of valid knowledge construction and effective knowledge governance. The book integrates inputs from economics and behavioural science with insights from the philosophy of knowledge to define new micro-foundations: neither a calculative, deductive and omniscient ‘rational actor’; nor an experiential, adaptive and biased ‘behavioural actor’; but a knowledgeable and imaginative ‘epistemic actor’. The implications for contracts and organizations, sustained also by insights from law, are shown to be far reaching, including a new view of the nature of the firm as an entity-establishing agreement under which to discover uses of resources under uncertainty, and as a democratic institution. Anna Grandori is Professor of Business Organization at Bocconi University, Italy.